I'll see what I can do to strip out the alt functions and make it into an Altaholic style library. No worries though if it's too much of a potch. Despite using an extensive range of addons I've always been a tad OCD about micro-managing my bags. However, the Altoholic functionality you've enabled in your version of Bagnon is so useful for crafting and keeping track of mats, etc on bank alts that I'm willing to adjust to the "chaos" of a one-bag layout haha. Oh well, in case there is a different need than yours, I'll post mine here, maybe you can take the skins I merged and add it in yours or something. Added skins from both versions together and put it up on github. Thanks for this, appreciate finally having a working Caith. Any way to get the rotating cooldown display working? Updated with the backport of my Actioncrits addon as well as individual download links, Enjoy! Just asking out of curiosity. 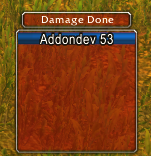 Would it be hard to change shaman pink color to blue color on Damagemeters?